Technically you're right. But that's not the point. 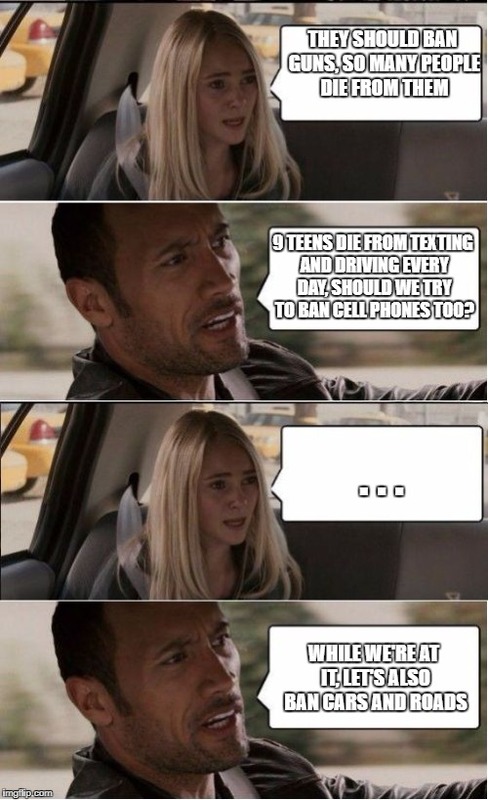 Texting and Driving is illegal, but so is Mass Murder. If you're not going to blame the phone, why would you blame the gun? Just let humans take responsibility for their actions. Ok, so this post isn't necessarily targeted at you. Gun: Product with only the purpose of killing people which is the thing we want to lesson. Strawman: Your argument trying to deflect from the issue because you're an idiot that thinks "gun laws" means "ban all guns" and you'd rather protect an archaic freedom than prevent innocent people from dying. It has reduced it, though. I do text while I drive, but not as much as I would if it were legal. Also, if passing laws doesn't stop people from doing things, why do we even have any laws in the first place? The reason is because passing laws will prevent at least *some* people from doing those things. That's correct, but those who really want to do it won't be stopped. As you said you do yourself. And in the case of guns, criminals really want to use them. However, law-abiding citizens will most likely turn in their guns.